For most of its history, ecology has not been a guiding principle for the management of Stanley Park. This is one of the observations that I made in my book Inventing Stanley Park: An Environmental History. Throughout the twentieth century, Park Board officials and Vancouver residents struggled over how to manage the various uses of the park: passive leisure, active recreation, urban infrastructure, tourism promotion, scenic preservation. Ecological sciences and the desire to preserve ecosystems in this large urban park did not begin to influence park management policies until the late 1980s and early 1990s. 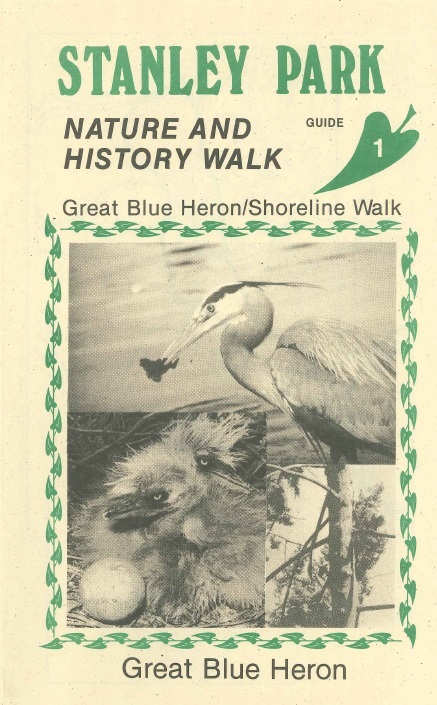 In 1990, Peter Hamilton published a series of pamphlets on the history and ecology of Stanley Park called Stanley Park: Nature and History Walks. Hamilton is the founder of Lifeforce, a local ecology organization in Vancouver that was established in 1981. Along with other environmental organizations, Lifeforce began to pressure the Vancouver Park Board to protect the ecological values of Stanley Park. In particular, it was at the forefront of opposition to the Board’s plans to expand the Stanley Park Zoo in the early 1990s. That opposition resulted in a 1993 referendum decision to close the zoo. In the wake of the referendum, the Stanley Park Zoological Society reconstituted as the Stanley Park Ecology Society. SK: Why did you produce these pamphlets? Why Stanley Park? What made this park of particular interest to you in the early 1990s? PH: Throughout the decades Stanley Park faced many attempts to further commercialize it with intrusive businesses including an expanded zoo and the Vancouver Aquarium. It was time to raise public awareness of the need to protect the natural beauty and diversity of wildlife. Stanley Park has a diversity of wildlife living and migrating through. It was time that the public became aware of this free ecology classroom to enjoy and respect the wonders of nature. SK: How would you characterize the state of the environment of Stanley Park in the early 1990s? PH: In the 90s its natural beauty and diversity of wildlife was threatened by ongoing Vancouver Aquarium expansions and a new expanded zoo. The brochures and Lifeforce information about the plight of captive zoo animals helped educate the public. Vancouverites voted against a zoo and further encroachment on scarce Stanley Park that is a National Historic Site (this was applied for by Lifeforce). The zoo was closed but the battles continue with the Vancouver Aquarium’s zoo plans. Parks Board Commissioners and many members of the public were not aware of the diversity of wildlife in Stanley Park. This includes seals, sea lions, and orcas off the shoreline. The Aquarium claimed it was too expensive to see orcas in the wild because people had to go north. The last 1990 beluga pool expansion was to undergo a federal environmental review but the Vancouver Aquarium (VA) started construction and destroyed a popular historic duck habitat. The old 2006 plans were brought before the City and public, but present expansion plans have not been brought forward. Residents and tourists can enjoy Stanley Park and the Aquarium without captives such as cetaceans. SK: What were the most significant changes to the management of the park that you have seen since you produced these pamphlets? Greater focus of “non-commercial” activities. The Stanley Park Zoological Society promoting the zoo changed to the Stanley Park Ecological Society with nature walks etc..
Why is Stanley Park and dolphin protection the same issue? It is because there are those who love the park, those who love dolphins and those who love both. Without these long time combined forces against the ongoing aquarium expansion we would have a SeaWorld-size building consuming the park. They could have won to build through Lumberman’s Arch to the waterfront or even take over Brockton Oval. Stanley Park is Vancouver’s “crown jewel” and you do not cut up a precious treasure. Stanley Park is cherished and you protect what you love. SK: Your pamphlets focus on nature and history. What do you see as the connection between the two? PH: As nature was threatened with historic development in the park the brochures educated people about the past so the harmful destruction would not be repeated. There were negative things such as people building homes in the park and, in some cases, historic activities that fitted in with nature such as trail making. If permitted, the present Vancouver Aquarium will double in size. The public said No More Zoo! and captivity that would include the present penguins and future river otters. They even want to include beaver who are living freely in the park. Others species could include Arctic fox. The natural beauty of Stanley Park and wildlife inhabitants could be viewed on video cams. The well known “Eagle cam” David Hancock has proposed including ones at Beaver Lake to view the beaver dam. Why put them in Aquarium prisons? A lot can be learned from such observations in the wild. Apparently the new hummingbird one in Esquimalt discovered that they can have four nests annually not the one as previously thought. Lifeforce has proposed to Parks Board staff several wildlife video cams throughout Stanley Park. The added benefits of such video cams include access to all people (locally and internationally), homebound people, public safety, animal protection, fire/arson monitoring, and much more. This free ecology classroom must be promoted and protected. We live in Super Natural BC and that is more spiritually and financially profitable. Stanley Park itself is a major tourist attraction. It is a free ecology classroom with a diversity of resident and migrating wildlife for all to enjoy. Why imprison wildlife when they can be viewed in their natural homes? Why imprison river otters in the Aquarium when the residents said No More Zoo! Why imprison beaver in the Aquarium when they live freely in Beaver Lake? SK: What are the most significant ecological characteristics of Stanley Park? PH: See the brochures. There are many.